PulseTV was launched in 1996 and the story behind the company is actually very interesting... The company started by promoting DVDs on TV and later started to offer other products due to customer demand; people were sending them emails and letters asking if they could get other TV products. Well, the company listened and as a result have managed to ride the internet bubble and survive the burst. PulseTV has also managed to bring something unique to the web by showing videos of the products that they sell. Now if that isn't enough, PulseTV also offers plenty of discounts on their site and the PulseTV deal of the day is amongst them and definitely something that shoppers should keep a close eye on. 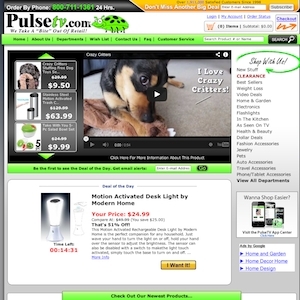 Deal.pulsetv.com currently ranks #93 amongst sites offering online deals -- SharkStores ranks #92. In the General Merchandise category, PulseTV ranks at #33 -- Sharkstores.com again ranks slightly higher at #32.